Staff photo by Erin O. Smith / Local officials, several individuals in the Morning Pointe administration and others involved with the project pose for a photo at the groundbreaking ceremony for the new East Hamilton Morning Pointe Assisted Living and Memory Care center in the 9700 block of East Brainerd Road Thursday, September 13, 2018 in Ooltewah, Tennessee. The new senior living facility will provide assisted living care plans, oversight of wellness and medication, activity programs, therapy services and more. Work officially started Thursday on a $35 million senior living campus which officials said will meet needs in rapidly growing East Hamilton County. 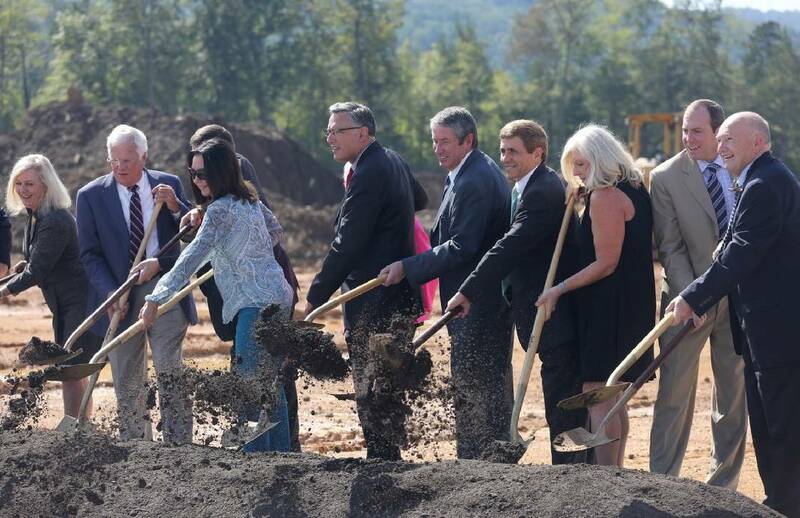 Morning Pointe of East Hamilton is the newest senior living facility to break ground in the Chattanooga area. A senior housing complex just opened off Shallowford Road near Hamilton Place and a Knoxville developer has plans for a new independent living facility in Hixson. Greg Vital, chief executive of Morning Pointe Senior Living, said that facility will create 250 jobs when it's fully built out on 24 acres off East Brainerd Road just past Ooltewah-Ringgold Road. "Hamilton County is an attractive place to live, work and retire," he said. "People are living longer. They want additional housing options." The first phase, to be ready in about a year, will house a 73-unit assisted living community, Vital said. Also, it will hold an Alzheimer's services component, he said. A second phase will hold a 120-unit independent living center to meet the needs of the age 55 and above population. A final phase will house a 60-unit freestanding The Lantern at Morning Pointe Alzheimer's Center of Excellence. The Chattanooga-based company has six campuses in Hamilton County and 31 Morning Pointe Senior Living and The Lantern at Morning Pointe Alzheimer's Memory Care Center of Excellence communities in five southeastern states. Vital said he has seen more grandparents of people living in Hamilton County moving to the area, citing quality of life and medical services. "This fills a hole," he said told a group of about 75 people about the new facility. Franklin Farrow, Morning Pointe Senior Living's chief operating officer, said the company has "sister communities" in Hamilton County and the newest campus adds to its brand. "This is kind of a small version of our Greenbriar Cove campus," he said about the Collegedale facility. Farrow said the new complex represents the first time all of the entities involved in its design and construction, except one, are local. "We are pleased to have been able to build, buy and provide jobs right here in East Hamilton County," he said. Hamilton County Commission Chairwoman Sabrena Smedley said she has heard that 22,000 new people have moved into the county and homebuilders want to raise over 10,000 more homes between now and 2022. With the idea of new families moving into the county, she said, Morning Pointe is focusing on the senior population. Smedley said the new facility will create 250 construction jobs, and the campus will have a $30 million a year impact. "Developments like this are what keep Hamilton County moving forward," she said. Hamilton County Trustee Bill Hullander said the new campus is "a neighborhood facility." He said families won't have to travel downtown or to other areas to see residents living at the new site. A few weeks ago, the Ashwood Square retirement community opened at 7683 Shallowford Road. That $30 million facility with 120 apartments was constructed Resort Lifestyle Communities of Lincoln, Nebraska. Also, earlier this week, Dominion Development Group said it plans to construct a 93-unit independent living complex on Northpoint Boulevard behind the Northgate Mall movie theaters. That project still needs to gain final rezoning approval from the City Council.